Death Toll Rises As Investigation Into Chinese Port Explosions Continues : The Two-Way One survivor, a 19-year-old firefighter, was found Friday. The remains of five more victims were also found. 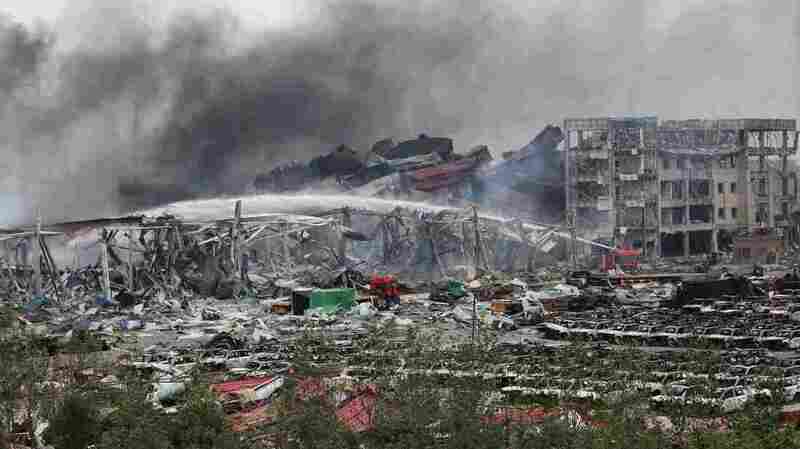 Firefighters work at the warehouse explosion site in Tianjin, north China, Friday. Scorched cars are in the foreground; toppled shipping containers are in the background. Two days after twin explosions devastated a warehouse area in northeast China, officials say the death toll has risen to 56, including 21 firefighters. More than 6,000 people have been relocated over contamination concerns; the warehouse contained dangerous chemicals. The authorities are still trying to determine what caused the huge explosions in an industrial area of the port city of Tianjin, where some fires have continued to burn. "State media say the shipping company where the explosion took place in the city of Tianjin stored dozens of flammable chemicals, including ingredients for gunpowder," NPR's Frank Langfitt reports from Tianjin. Frank adds that the materials stored in the logistics facility contributed to a blast that was reportedly equal to 21 tons of TNT. One survivor, a 19-year-old firefighter, was found Friday, reports the People's Daily, which adds that the remains of five more victims were also found. At least 18 people remain missing, and more than 700 people are hospitalized. The explosions sent shockwaves and flaming debris through a wide area. The damage includes nearly 10,000 new cars that had been stored in a nearby lot; the People's Daily says many of them were Renault and Volkswagen models. According to the state-run Xinhua news agency, "A team of nuclear and chemical specialists are working at the site now to determine the extent of toxic materials there. The specialists have to pass through a decontamination spray after they return from the central area of the explosion site." Despite the fires that continue to burn, Xinhua reports, "the situation is now basically under control."